We are the first to admit this fact. But we find it really painful when a user goes unfed just because we could not deliver his/her meal on time. We hope from the core of our heart that you might have made an alternate arrangement to meet your hunger. At RailYatri, we are constantly hustling to make sure that we increase our successful delivery ratio. We have taken a big step towards attaining this goal by launching a new food ordering flow for Meals on Train. And guess what, it is simpler than ever before! Our new food ordering process not only assures successful delivery of each food order placed with us, it also helps the users place a food order in just three simple steps. What’s so exciting about this new food ordering flow? 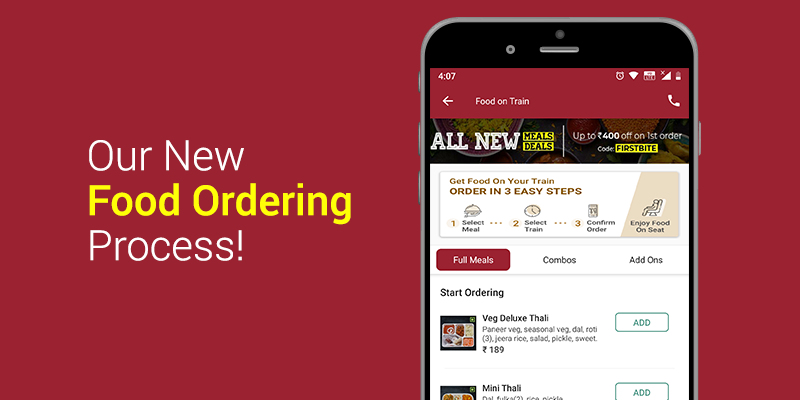 Previous food ordering process, of RailYatri app, would leave too many duties upon you. You had to choose a probable pick-up point for food delivery, choose a restaurant which you believed would cater good food and then handpick choice of dishes. We understood that this was a long and tedious process. While we wanted users to have the freedom of making their choices, but we were somehow asking too much from our beloved users. So, we have generalized the food ordering flow giving you less things to think about! The food flow allows you to explore the most ordered (and thus most popular) food options as soon as you land on the Meals on Train section of the app. All you have got to do is tap on your choice and increase the quantity of the order as per your need. Handpicking personal favorites for your travel troupe can be a cumbersome task. So, we have removed that hassle for you. Having spent many years studying the trends of train travel we understand the variables (such as delays, early arrivals of trains, etc.) and that is why our new food flow auto-detects your food pick-up point rather than allowing you to choose the same. We keep all the train travel factors in mind before suggesting the pick-up point and are even ready to make changes if the situation demands it. With the new food flow, all you have got to do is select the date and type of order (Lunch or Dinner) and the rest would be auto-detected by our apps smart back-end. Liked the old process? Want to order some unique dishes? Well, we have kept that option open for you as well. Scroll down and visit the section titled – “Still hungry for more?” You would be routed to previously used food ordering process. Tap on Explore more and you would be able to handpick any of the items that are available in the RailYatri Meals on Train menu. #5: 1, 2, 3 & Its Done! Visit ‘Food on Train’ feature in RailYatri app. Select your food item from our ‘Popular Items’ list and Tap on ‘Continue’. Fill in the Train details or provide PNR number. Choose delivery date and the Meal time (Lunch or Dinner). Provide the Seat & Coach number and some other personal details. And you would be routed to the Payment Screen. Make the payment and it’s done! We request you to try this new ordering process and write back to us with your suggestions. Next articleLook what we have done with your GPS data!